Congressional Republicans on Wednesday turned the high heat on CBS News, charging that last week's revelations about Lt. George Bush, which aired on 60 Minutes, were based on fake documents and demanding that 60 Minutes and Dan Rather retract the story. "It's very clear the documents were forged. They were laid on him and this time he bit," said Sen. Robert Bennett, R-Utah. Forty members of the House signed a letter accusing the network of deception. The letter asked CBS if the documents are authentic, and why the network won't say how it got them, reports CBS News Correspondent Wyatt Andrews. "I think at the very least CBS should characterize the source," said Rep. Roy Blunt, R-Missouri. "I think it's amazing that they haven't already done that." In a related development, CBS News released a statement renewing its defense of the story. The network also released letters from two document examiners who reviewed the memos. The dispute involves memoranda 60 Minutes says it got from the personal file of Lt. Bush's Air National Guard commander, Lt. Col. Jerry Killian. The memos accuse Mr. Bush of disobeying an order and of using connections to have Killian "sugarcoat" Mr. Bush's record. However, some experts doubt the authenticity of the memos. They believe they were produced by a computer not available at the time, exhibit stylistic differences with other documents attributed to Killian, contain information that appears to be dated and use military lingo that is not accurate. Meanwhile, associates of the Col. Killian are split on whether the content of the memos reflected his thinking at the time. Killian's secretary — in an interview with 60 Minutes — tells Rather she too believes the memos are fake, but accurately reflect Killian's view of Lt. Bush. "I know that I didn't type them. However, the information in those is correct," Marian Carr Knox said. Knox said Col. Killian liked Mr. Bush, but not his attitude. "Killian was very friendly with Bush. They had fun together. And I think it upset him very much that he was being defied," she said. CBS News officials said the memos came from a confidential source, and cite longstanding journalistic practice in refraining from describing how they obtained the documents. The network said it remains certain that the content of the story is true. "We would not have put the report on the air if we did not believe in every aspect of it," said CBS News President Andrew Heyward. However, Heyward also said the network will try to clear up what he calls the unresolved issues. "Enough questions have been raised that we are going redouble our efforts to answer those questions," he said. CBS News says the original report used several different techniques to make sure the memos were genuine, including talking to handwriting and document analysts and other experts who strongly insist that the documents could have been created on a typewriter in the 1970s -– as opposed to a modern-day word-processing software program. After the controversy arose, the network has interviewed other experts who support that the memos could have been written on a machine available in 1972 and 1973. CBS has also said its story about Mr. Bush's guard service relied on much more than documents. Featured in the segment was former Texas Lt. Gov. Ben Barnes, a Democrat who claims he pulled strings to get Mr. Bush into the Guard in 1968. Wednesday's CBS statement came as two document examiners used by CBS told ABC News they questioned aspects of the story before it aired. Emily Will, a documents examiner from North Carolina hired by CBS, said she told the network before the report aired that she questioned handwriting in the documents she was shown and whether it could have been produced by a typewriter. Her main concern was that she was not provided a known sample of the signature to use for comparison. Will said she e-mailed a CBS producer and urged her the night before the broadcast not to play up that a professional document examiner had authenticated the papers. Another expert hired by CBS, Linda James of Plano, Texas, told ABC, "I did not authenticate anything and I don't want it understood that I did." James told AP late Tuesday she raised similar concerns about signature samples. CBS News said that Will and James played only a "peripheral role" in assessing the documents. "In fact, they assessed only one of the four documents used in the report, and while one of them raised a question about one aspect of that one document, they did not raise substantial objections or render definitive judgment on the document," the CBS statement said. Ultimately the network deferred to another expert who has seen all four documents, Marcel Matley. In a letter produced by CBS News, Matley says he believed the same person signed "Jerry B. Killian" on all the documents he saw. Another expert, James Pierce, wrote, "the balance of the Jerry B. Killian signatures appearing on the photocopied questioned documents are consistent and in basic agreement." Pierce also stated that based on what he knew, "the documents in question are authentic." 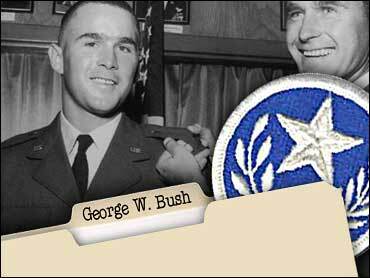 Questions have been raised for years about Mr. Bush's entry into and service in the Guard, especially a period from mid-1972 to mid-1973 for which there is conflicting evidence Mr. Bush performed his duties. It is known that he missed a flight physical during that time and asked for permission to transfer to an Alabama unit to work on a campaign there. The White House contends Mr. Bush received no favorable treatment and fulfilled his duties. But newly released computerized payroll records show no indication Mr. Bush drilled with the Alabama unit during July, August and September of 1972, The Associated Press has reported.